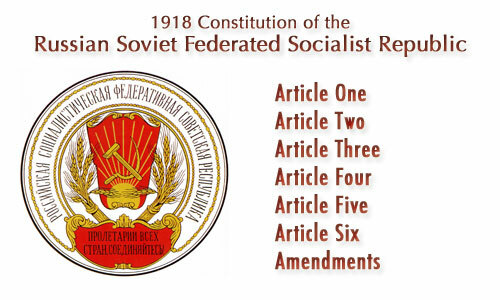 The declaration of rights of the labouring and exploited people (approved by the Third All-Russian Congress of Soviets in January 1918), together with the Constitution of the Soviet Republic, approved by the fifth congress, constitutes a single fundamental law of the Russian Socialist Federated Soviet Republic. This fundamental law becomes effective upon the publication of the same in its entirety in the 'Izvestia of the All-Russian General Executive Committee.' It must be published by all organs of the Soviet Government and must be posted in a prominet place in every soviet institution. The fifth congress instructs the People's Commissariat of Education to introduce in all schools and educational instituitions of the Russian Republic the study and explanation of the basic principles of this Constitution.